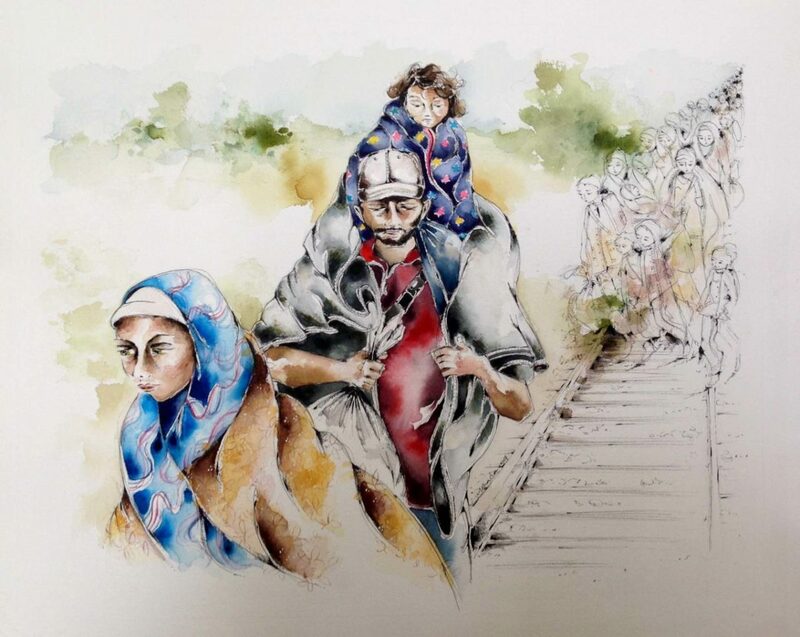 Painter Naomi Cox will show a series of watercolors to highlight the plight of Syrian refugee. Art will be on display April 2-30 at Dubsea Coffee in White Center. An artist reception will take place April 8 from 5-7 p.m.
Naomi Cox's painting "Migration to Serbia" is one of a dozen paintings that will be on display at Dubsea Coffee in White Center April 8. SEATTLE (March 28, 2017) — As the Syrian refugee crisis enters its seventh year, it’s difficult to imagine what new events could make life worse for the millions of Syrians who have fled their homes to escape the violence of the country’s brutal civil war. More difficult still: how to maintain fresh compassion when the numbers of those killed, injured, displaced and in need have grown to the point of becoming paralyzing. Local painter Naomi Cox, started her job as a designer at World Vision three years into the crisis. Four years later, she was looking for a way to come to grips with the tragedy, refresh her compassion and do something active to help refugees through her talent as an artist. From that sense of frustration and restlessness, “Displaced :: Moments in the Lives of Syrian Refugees” emerged. This series of 12 watercolor paintings depicts life for refugees fleeing Syria by boat, migrating into Europe by land, and stuck in camps and settlements in Lebanon and Jordan. The paintings will be on display April 2-30 at Dubsea Coffee, 9910 8th Ave SW in Seattle. An opening reception will be held April 8 from 5-7 p.m. Proceeds from art sales will be donated to World Vision’s Syrian Refugee Crisis Fund.